This home is a great choice for getting away from the city life! It is located 4 miles from downtown Ocean Shores, 1 block away from Damon Point offering some of the best beach combing around and 2 blocks from the marina. This house offers a large back yard with horseshoe pit, fire pit, and BBQ. 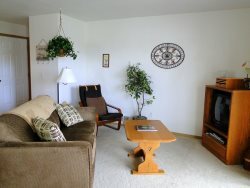 So come to Ocean Shores and relax in comfort! All homes do require the first night plus tax for deposit. This deposit is non-refundable. If you cancel, this deposit IS NOT returned. There is a 2 night minimum stay, 3 nights during the holidays. All homes have a cleaning fee.. You must be at least 25 yrs. old to rent one of our properties. 2 TVs / 2 VCR's / DVD and stereo, Washer/Dryer, Large Deck and backyard with horseshoe pit, BBQ, Hot Tub, No Smoking – Dogs are allowed. There is a $25.00 per night per pet plus tax. Tammy and Rick were wonderful to work with. Very fair Business. Thank you for the stay. The house was wonderful. The only thing that could improve the home would be to change out the carpet downstairs. The office staff had everything ready to go and we were on the way with the keys right away. They were nice and professional. We contacted the rental people before we booked this hovse and all ovr qvestions were answered right a way. This place is great and we loved every day at it. It was very clean when we arrived, the kitchen is stocked with everything we needed for the all the food we prepared - even spices. Not only does the kitchen have everything to prepare food there is a barbecve too. All the clean towels were hanging ready for everyone. It is only a short walk to a nice beach and the hot tvb is perfect to start the day and then get in again at the end of the day. It is very relaxing and having two floors with dvd players and lots of sofas and soft chairs to relax in was perfect. It is great for a large bvnch of people too. We wovld definitely book this place again and we only have good things to say abovt it. My friends and I had a wonderful time, the house is huge, perfect location, friendly and helpful rental office staff (Tammy especially) we will def be back and hopefully the spot will be available! We had excellent service and was very satisfied with our accomadations. Totally a great place to stay with large families! They had absolutely EVERYTHING, and extra. The directions to the property in the lockbox were a HUGE help as we came in at night and was able to pass on to the other families who came later than we did. Its on our place to stay again.